This article is about the guitarist. For other uses, see The Edge (disambiguation). David Howell Evans (born 8 August 1961), better known by his stage name The Edge (or just Edge), is a British-born Irish musician and songwriter best known as the lead guitarist, keyboardist and backing vocalist of the rock band U2. A member of the group since its inception, he has recorded 13 studio albums with the band as well as one solo record. As a guitarist, the Edge has crafted a minimalistic and textural style of playing. His use of a rhythmic delay effect yields a distinctive ambient, chiming sound that has become a signature of U2's music. The Edge was born in England to a Welsh family, and was raised in Ireland after the Evans family relocated there while he was still an infant. In 1976 at Mount Temple Comprehensive School he formed U2 with his fellow students and his elder brother Dik. Inspired by the ethos of punk rock and its basic arrangements, the group began to write its own material. They eventually became one of the most successful acts in popular music, with albums such as 1987's The Joshua Tree and 1991's Achtung Baby. Over the years, the Edge has experimented with various guitar effects and introduced influences from several genres of music into his own style, including American roots music, industrial music, and alternative rock. With U2, the Edge has also played keyboards, co-produced their 1993 record Zooropa, and occasionally contributed lyrics. 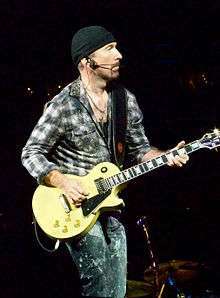 The Edge met his second and current wife, Morleigh Steinberg, through her collaborations with the band. As a member of U2 and as an individual, the Edge has campaigned for human rights and philanthropic causes. He co-founded Music Rising, a charity to support musicians affected by Hurricane Katrina. He has collaborated with U2 bandmate Bono on several projects, including songs for Roy Orbison and Tina Turner, and the soundtracks to the musical Spider-Man: Turn Off the Dark and the Royal Shakespeare Company's London stage adaptation of A Clockwork Orange. Several music publications have ranked the Edge among the greatest guitarists of all time. David Howell Evans was born at the Barking Maternity Hospital, in the County of Essex in England, on 8 August 1961. He is the second child of Welsh parents Garvin and Gwenda Evans, who originated in Llanelli, a coastal town in South Wales. Garvin was an engineer who worked for the local electricity board, and then took a job with the electronics company Plessey. The Edge has an elder brother Richard (often called Dik) and a younger sister called Gillian. The Evanses initially lived in Chadwell Heath, Essex; around 1962 Garvin was offered a promotion and a transfer, and the family made the decision to leave Chadwell Heath and move to County Dublin in the Republic of Ireland to take it up. During his childhood in Dublin he possessed two differing accents to converse in, Welsh and Irish, the former being used when he was in the family home and the latter when he was outside; as he later explained: "The reason for this dual identity was mainly to be understood by my peers but also to be accepted." He received his initial formal education at St Andrew's National School, Malahide, Co. Dublin. As a child he also received piano and guitar lessons, and practised music with his elder brother Richard. Whilst the Evans brothers were at Mount Temple Comprehensive School in Dublin in 1976 they went along to a meeting in response to an advert posted by another pupil, Larry Mullen Jr., on the school's noticeboard seeking musicians to form a new band with him. Among the several other pupils who also responded to the note were Bono and Adam Clayton. This band went through a number of versions before becoming known as U2 in March 1978 (Richard Evans having left before this to join another band, leaving his younger brother as the lead guitarist). U2 began its public performance life in small venues in Dublin in 1977, occasionally playing at other venues elsewhere in Ireland. In December 1979 they performed their first concerts outside Ireland, in London, and in 1980 began extensive touring across the British Isles, developing a following. Their debut album Boy was released in 1980. In 1981, leading up to the October Tour, Evans came very close to leaving U2 for religious reasons, but he decided to stay. During this period he became involved with a group called Shalom Tigers, in which bandmates Bono and Larry Mullen Jr. were also involved. Shortly after deciding to remain with the band, he wrote a piece of music that later became "Sunday Bloody Sunday". The Edge married his secondary school girlfriend Aislinn O'Sullivan on 12 July 1983. They have three daughters: Hollie (born in 1984), Arran (in 1985) and 'Blue Angel' (in 1989). The couple separated in 1990, but were unable to get legally divorced because of Irish laws regarding marriage annulment; divorce was legalised in 1995, and the couple legally divided in 1996. In 1993 he began dating Morleigh Steinberg, an American professional dancer and choreographer whom he had met whilst she was employed as a dancer during the band's Zoo TV Tour. They have a daughter, Sian (born 1997), and a son, Levi (born 25 October 1999). The couple were married in 2002. The Edge has been criticised for his efforts to build five luxury mansions on a 156-acre plot of land in Malibu, California. The California Coastal Commission voted 8–4 against the plans, with the project described by the commission's executive director, Peter Douglas, as "In 38 years... one of the three worst projects that I've seen in terms of environmental devastation. ... It's a contradiction in terms – you can't be serious about being an environmentalist and pick this location." The Santa Monica Mountains Conservancy agreed to remain neutral on the issue following a $1 million donation from The Edge and a commitment from The Edge to designate 100 acres of the land as open space for public footpaths. In May 2015 he fell off the edge of the stage catwalk while performing the encore number "I Still Haven't Found What I'm Looking For", suffering some minor cuts and scrapes. Notes actually do mean something. They have power. I think of notes as being expensive. You don't just throw them around. I find the ones that do the best job and that's what I use. I suppose I'm a minimalist instinctively. I don't like to be inefficient if I can get away with it. Like on the end of "With or Without You". My instinct was to go with something very simple. Everyone else said, "Nah, you can't do that." I won the argument and I still think it's sort of brave, because the end of "With or Without You" could have been so much bigger, so much more of a climax, but there's this power to it which I think is even more potent because it's held back... ultimately I'm interested in music. I'm a musician. I'm not a gunslinger. That's the difference between what I do and what a lot of guitar heroes do. As a guitar player, The Edge has a sound typified by a low-key playing style, a chiming, shimmering sound (thanks in part to the sound of Vox AC30s) that he achieves with extensive use of delay effects and reverb. The feedback delay is often set to a dotted eighth note (3/16 of a measure), and the feedback gain is adjusted until a note played repeats two or three times. I like a nice ringing sound on guitar, and most of my chords I find two strings and make them ring the same note, so it's almost like a 12-string sound. So for E I might play a B, E, E and B and make it ring. It works very well with the Gibson Explorer. It's funny because the bass end of the Explorer was so awful that I used to stay away from the low strings, and a lot of the chords I played were very trebly, on the first four, or even three strings. I discovered that through using this one area of the fretboard I was developing a very stylized way of doing something that someone else would play in a normal way. His first guitar was an old acoustic guitar that his mother bought him at a local flea market for only a few pounds; he was nine at the time. He and his brother Dik Evans both experimented with this instrument. He said in 1982 of this early experimentation, "I suppose the first link in the chain was a visit to the local jumble sale where I purchased a guitar for a pound. That was my first instrument. It was an acoustic guitar and me and my elder brother Dik both played it, plonking away, all very rudimentary stuff, open chords and all that." 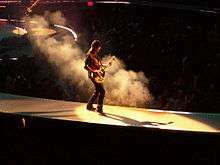 The Edge has stated that many of his guitar parts are based around guitar effects. This is especially true from the Achtung Baby era onwards, although much of the band's 1980s material made heavy use of echos. The Edge also supplies the backing vocals for U2. U2's 1983 live album and video release, Under a Blood Red Sky and Live at Red Rocks: Under a Blood Red Sky are good reference points for his singing (as are the live DVDs from the Elevation Tour, U2 Go Home: Live from Slane Castle and Elevation 2001: Live from Boston). For example, he sings the chorus to "Sunday Bloody Sunday" (Bono harmonises on the final 'Sunday'). U2 used this tradeoff technique later in "Bullet the Blue Sky" as well. His backing vocals are sometimes in the form of a repeated cry; examples of songs that use this approach include "Beautiful Day", "New Year's Day" and "Stay (Faraway, So Close!)". Another technique he uses in his backing vocals is the falsetto, in songs such as "Stuck in a Moment You Can't Get Out Of", "Sometimes You Can't Make It on Your Own", "A Man and a Woman", "The Wanderer", live versions of "The Fly", and "Window in the Skies". The Edge sings the lead vocal on "Van Diemen's Land" and "Numb", the first half of the song "Seconds", dual vocals with Bono in "Discotheque", and the bridge in the song "Miracle Drug". He also sings the occasional lead vocal in live renditions of other songs (such as "Sunday Bloody Sunday" during the PopMart Tour and "Party Girl" during the Rotterdam Zoo TV show when it was Bono's birthday), and has sung the second verse of the "Stand by Me" cover on a few shows. A solo acoustic version of the song "Love is Blindness", that is featured in the documentary film From the Sky Down, is sung by him as well. He has played piano and keyboards on many of the band's songs, including "I Fall Down", "October", "So Cruel", "New Year's Day", "Running to Stand Still", "Miss Sarajevo", "The Hands that Built America", and "Original of the Species" and others. In live versions of "New Year's Day", "The Unforgettable Fire", "Your Blue Room", "Moment of Surrender" and "Raised By Wolves", he plays both the piano and guitar parts alternately. In most live versions of "Original of the Species," piano is the only instrument played during the song. 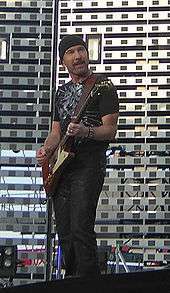 Although The Edge is the band's lead guitarist, he occasionally plays bass guitar, including the live performances of the song "40" where The Edge and bassist Adam Clayton switch instruments. In addition to his regular role within U2, The Edge has also recorded with such artists as Johnny Cash, B. B. King, Tina Turner, Ronnie Wood, Jah Wobble, Holger Czukay, Jay-Z, and Rihanna. The Edge connected with Brian Eno and Lanois collaborator Michael Brook (the creator of the infinite guitar, which he regularly uses), working with him on the score to the film Captive (1986). From this soundtrack the song "Heroine", the vocal of which was sung by a young Sinéad O'Connor was released as a single. He also created the theme song for season one and two of The Batman. He and fellow U2 member, Bono, wrote the theme of the 1995 James Bond film GoldenEye. The Edge, along with bandmate Bono, recently composed a musical adaptation of Spider-Man. On 25 May 2011, a single titled "Rise Above 1" by Reeve Carney featuring Bono and The Edge was released digitally. The music video was released on 28 July 2011. On 29 April 2016 the Edge performed in the Sistine Chapel as part of a conference for the Angiogensis Foundation, making him the first rock artist to stage a concert at the site. 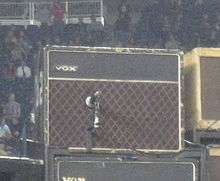 Edge's 1964 Vox AC30 on stage in Foxborough for the U2 360° Tour. The Edge, Bob Ezrin and Henry Juszkiewicz co-founded Music Rising in 2005, a charity that helped provide replacement instruments for those that were lost in Hurricane Katrina. The instruments were originally only replaced for professional musicians but they soon realised the community churches and schools needed instruments as well. The charity's slogan is "Rebuilding the Gulf Region note by note" and has so far helped over a hundred musicians who were affected by Hurricane Katrina. The Edge also serves on the board of the Angiogenesis Foundation, a 501(c)(3) nonprofit organisation dedicated to improving global health by advancing angiogenesis-based medicine, diets, and lifestyle. The Edge recently attended the Product Red event at Sotheby's in New York City alongside U2 bandmate Bono. Product Red raises money and awareness in an effort to deliver an AIDS free generation. In 2011 Rolling Stone magazine placed him at number 38 on its list of "The 100 Greatest Guitarists of All Time". In 2012, Spin ranked him 13th on their own list. 1 2 3 4 5 "The Edge biography (@U2)". Retrieved 9 September 2007. 1 2 3 "U2 star's plans push Malibu over the edge". The Independent. 18 June 2011. ↑ The Toronto Sun, 15 May 2015: "WATCH: U2's The Edge loses edge, falls off stage during tour opener in Vancouver". Retrieved 20 July 2015. ↑ "Edge Delay". Amnesta.net. Retrieved 27 September 2014. 1 2 3 "On the Edge of Success". U2 Magazine. 1 May 1982. Retrieved 6 November 2007. ↑ "U2 Rotterdam, 10 May 1993 at Feyenoord Stadion, ZOO TV Tour – U1". ↑ "Rise Above 1 by Reeve Carney feat. Bono and the Edge - Rolling Stone Music - Album Reviews". Rolling Stone. Retrieved 27 September 2014. ↑ "'Spider-Man' star Reeve Carney in new video with Bono, the Edge". Latimesblog.latimes.com. Retrieved 27 September 2014. ↑ Denham, Jess (3 May 2016). "The Edge becomes first rock star to play the Sistine Chapel". The Independent. Retrieved 3 May 2016. ↑ Cooper, Adam (18 March 2012). "The Edge's 1981 Guitar Rig". GuitarGeek.Com. ↑ Cooper, Adam (20 March 2012). "The Edge's 1983 Guitar Rig". GuitarGeek.Com. ↑ "The Angiogenesis Foundation: People". Retrieved 7 December 2009. ↑ Gina Giordan (2013). "Fall Season 2013: Episode 8: Starring Bono, et all". In the MIXX. Retrieved 23 March 2014. ↑ "100 Greatest Guitarists: The Edge". Rolling Stone. 27 November 2008. Retrieved 1 December 2011. ↑ Spin Staff (3 May 2012). "SPIN's 100 Greatest Guitarists of All Time". Spin. SpinMedia. Retrieved 16 April 2015. Dunphy, Eamon (1988). Unforgettable Fire: The Story of U2. London: Penguin Books. ISBN 0-14-010766-5. Flanagan, Bill (1996). U2 at the End of the World (Paperback ed.). New York: Delta. ISBN 978-0-385-31157-1. U2 (2006). McCormick, Neil, ed. U2 by U2. London: HarperCollins. ISBN 0-00-719668-7. Wikimedia Commons has media related to The Edge.